An unconscious tribute to Warren Kerrigan’s make-up in The Guardian of the Flock was paid him recently when two Mexicans from Tia Juana approached him. Kerrigan was costumed as a sheep-herder. In order to secure the proper atmosphere a number of Mexicans were picked up in Los Angeles’ ” Sonoratown ” to form a background. Upon arriving at the chosen location Kerrigan stood waiting on the outskirts of the crowd until he might be needed in the picture, when two Mexicans sided up to him. Just then a call from the Director interrupted the conversation, which sooner or later must have exposed the player’s joke. Mr. Kerrigan, far from being a Mexican, is of Irish descent. Three Hocks of sheep -nearly one thousand five hundred woolly little creatures—took part in the film and were herded together with difficulty. Respecto a esta película, The Guardian of the Flock, que por lo expuesto en la anterior nota contiene ingredientes mexicanos, no tuvo publicidad alguna en Estados Unidos y salvo la anécdota referida y el anuncio publicados en el semanio inglés Pictures and the Picturegoer. La cinta se exhibió en Estados Unidos pues aparece en las listas de estrenos que publicó la revista Motography los días 10 y 17 de abril de 1915 donde se establece que la cinta se estrenó el lunes 5 de abril de 1915. Sin embargo no hay sinopsis o reseñas de la cinta en las revistas especializadas norteamericanas. El personaje de Warren Kerrigan, según la descripción del anuncio, es un individuo despiadado y cegado por la venganza, aparte es mexicano. Otro ejemplo de que los vicios y los defectos eran propios del otro; del diferente. Owning to the Patriotic Pictures being held last night the Criterion Pictures will be shown to-night. The programme selected is one of the best that has been screened for some time past. 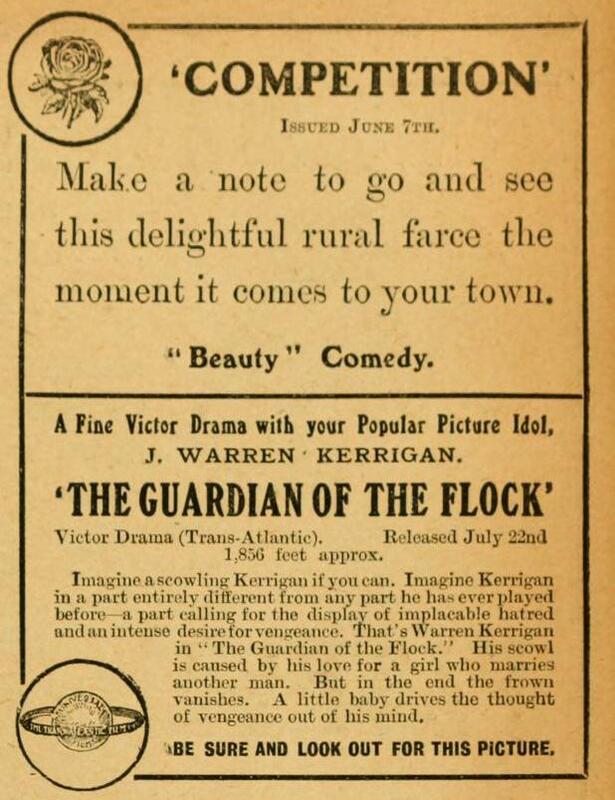 The star drama is a Western Romance, entitled “The Guardian of the Flock,” featuring Warren Kerrigan, the noted American actor. Three flocks of sheep, 1500 in all, take part in this picture. Warren Kerrigan is given an opportunity to display his skill as a sheep herder, and charms all hearts. The story is a beautiful one, and should not be missed. Supporting this are two excellent dramas, the latest war tropical, comics, scenic, etc. Ficha filmográfica: Producción: Victor Film Company. Director: Jacques Jaccard. 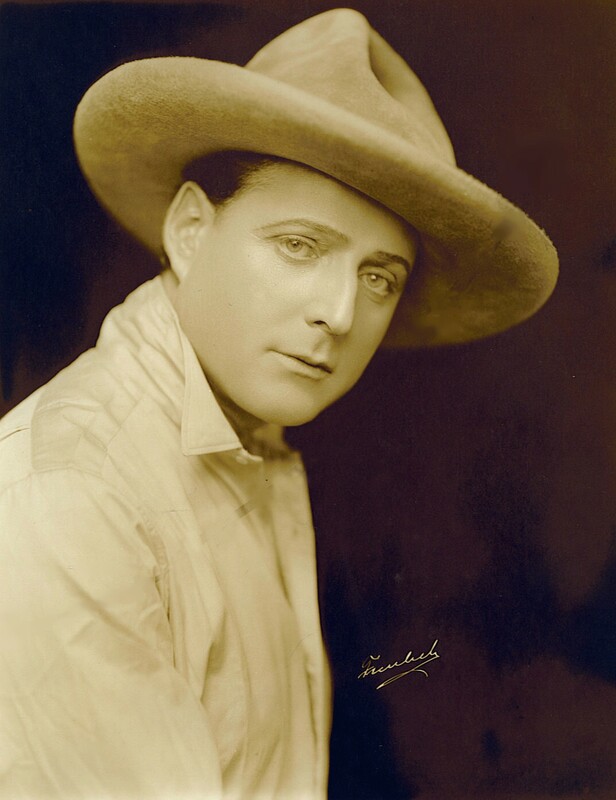 Guión: W. M. Caldwell. Intérpretes: J. Warren Kerrigan (Tony Tafoya), Vera Sisson (Rosario), George Periolat (Bull McKnight), Jessalyn van Trump.